ASIA/MYANMAR - Card. 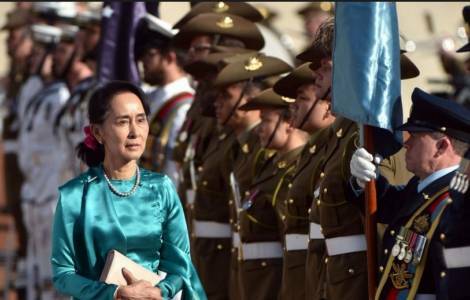 Bo: "The silence of Aung San Suu Kyi speaks of pain, responsibility, struggle for peace"
Sydney (Agenzia Fides) - "Peace in Myanmar is a primary commitment, not only for Myanmar, but for the whole world. It could become an example for the rest of the world: a country in which 135 different recognized ethnic groups coexist after long conflicts": says Cardinal Charles Maung Bo, Archbishop of Yangon to Agenzia Fides, during his visit in Australia, invited by "Catholic Missio" Australia, the Australian National Directorate of the Pontifical Mission Societies. The Cardinal recalled the thought of Democratic leader Aung San Suu Kyi who says: "We cannot leave the heavy burden of conflict on the shoulders of the younger generations". And then, in the face of criticism addressed to her by international observers, Mgr. Bo comments: "Aung San Suu Kyi is Myanmar. There is such a strong identification that goes beyond politics. She has suffered with her people, she was not bent by the suffering, rather she turned it into a struggle for freedom, in the hope of a change, through non-violence, through silence, through responsible action that respects the times of history in order not to return to fear, dictatorship or violence. The Cardinal notes: "We are living the painful history of conflicts, which is being brought to light today: especially in the Rakhine state, where a Muslim population suffers, or in the Kachin state, where Christians are suffering, hundreds of thousands of victims of violence are before our eyes. In the difficult balance between the still unfinished democracy and the political role of the army, we follow the efforts of the civil government of Aung San Suu Kyi for the repatriation of Muslims in Rakhine, the ceasefire, the process of reconciliation and peace with the 21st century Panglong Conference. The government encourages religious dialogue and pluralism, looking at sustainable development and federalism that promotes inclusion and autonomy". The Cardinal recognizes a "profound communion between Aung San Suu Kyi and her people" recalling that "Aung San Suu Kyi in her speech to the country on the evening of April 1, on the second anniversary of her government, called for mutual support in order to meet the challenges: unity between government and people, between parties and civil society, between ethnic groups, religions, even with the army".